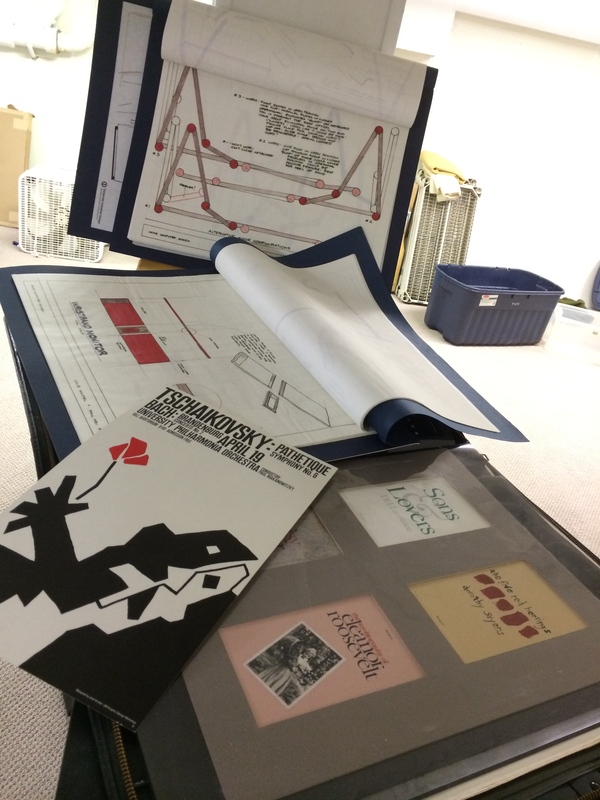 Artifacts from my design portfolio that were on the way to the trash. I posted this picture just to provide a bit of respect. A Facebook hue and cry saved them. There must be some deep psychology behind each “keep/store/donate/sell/trash” decision. Though I was generally pretty ruthless (see above), I saved my own 15th birthday present. It’s a sweet little Olivetti Underwood manual typewriter in a blue and white plastic case. I have not used it since I got my first P.C. in 1984. Over the intervening 30 years the typewriter’s innards had rusted to total disrepair. I could see it happening, in the basement as I would occasionally pass by it, pause, click open the cover to a whiff of dust and ink, reminisce, sigh, close it up, and go back to whatever I was doing. Yet in my many, many waves of clearing house over the decades, it always made the cut. I think it was because this two-tone baby was such an important part of my student days. This typewriter represented a super exciting gift at a very hard time in my life (what 15 year-old thinks their life is easy anyway?). In my case the typewriter is associated with some tough early struggles as a scholarship student at an elite boarding school. In my first disconcerting semester as a sophomore, when I was trying to find a way–any way–around my own huge academic deficiencies, I was so happy to have this new typewriter. It meant I could “finally” hand in professionally-prepared English papers, like all the wealthy kids around me. Later, as an industrial designer, I became a huge fan of Olivetti’s products and so I felt smug or smart about having owned one such product myself. 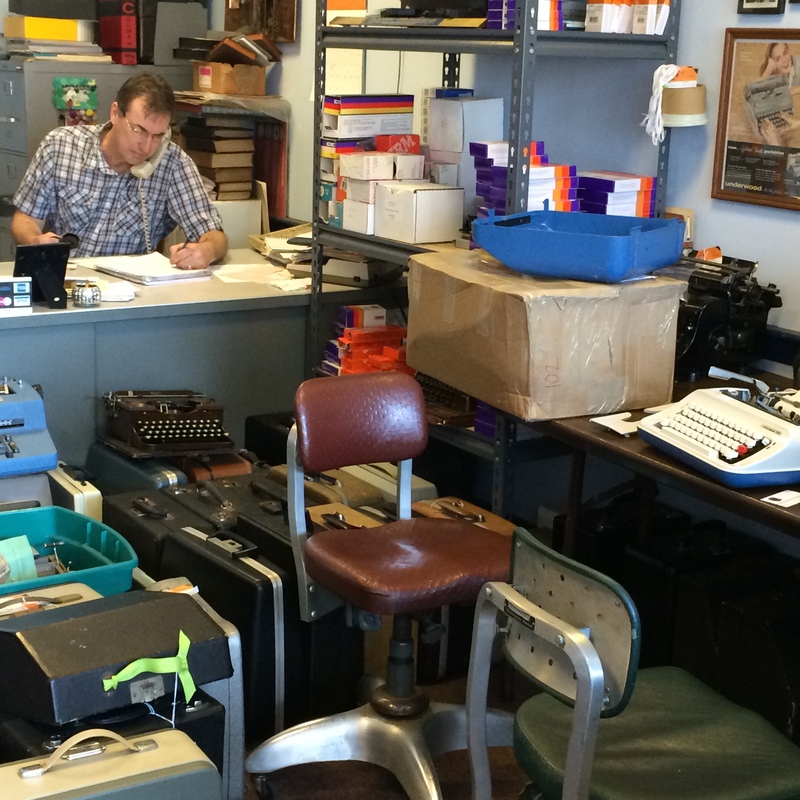 Fast forward to today, my office happens to be within a short drive of…a tiny typewriter repair shop. 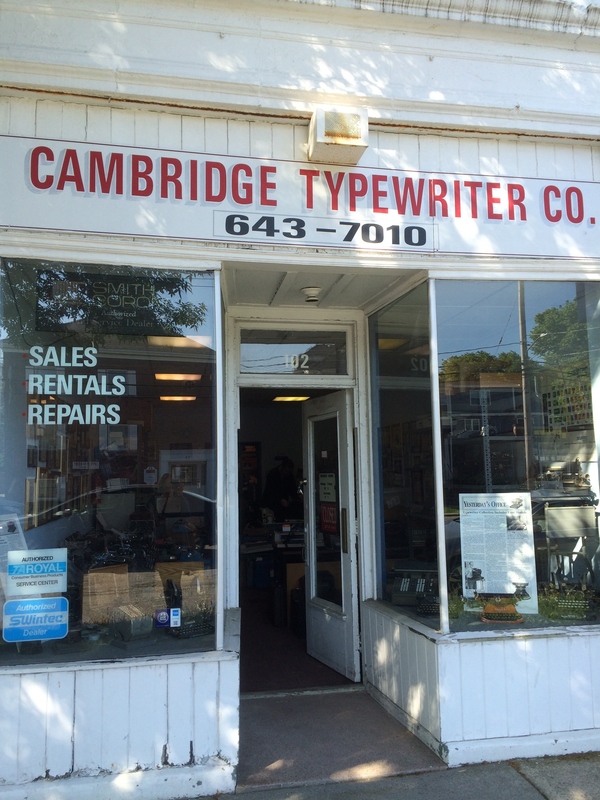 So one day while swirling in the tornado of house evacuation, I tentatively carried my old faithful machine in the door of Cambridge Typewriter Co. Within two steps the unmistakeable smell of ribbon ink took me back decades. Tom Furrier, the proprietor, told me that though the prognosis for my sad little Olivetti Underwood was uncertain, he was up for the challenge. Thankfully, six weeks and $95 later, the operation was a success and I was inspired to learn more about Tom and the typewriter business. I knew real-deal vintage manual typewriters were popular as hipster decor items, but I suspected a deeper story. This proved to be true. Firstly, don’t worry about Tom Furrier or Cambridge Typewriter Co., Inc. He’s been in business 35 years and the joint is jumpin’. After some near-death experiences in the 1990’s, Tom sensed a reversal of fate as early as 2001 when the first trickle of young, tentative customers darkened his door. Their little stream turned into a flood around 2005 and now people under 30 represent a third of Tom’s business. By point of fact, the phone rang off the hook the whole time I was in the shop, and Tom says a line sometimes forms on Saturday, when the store fills to bursting. 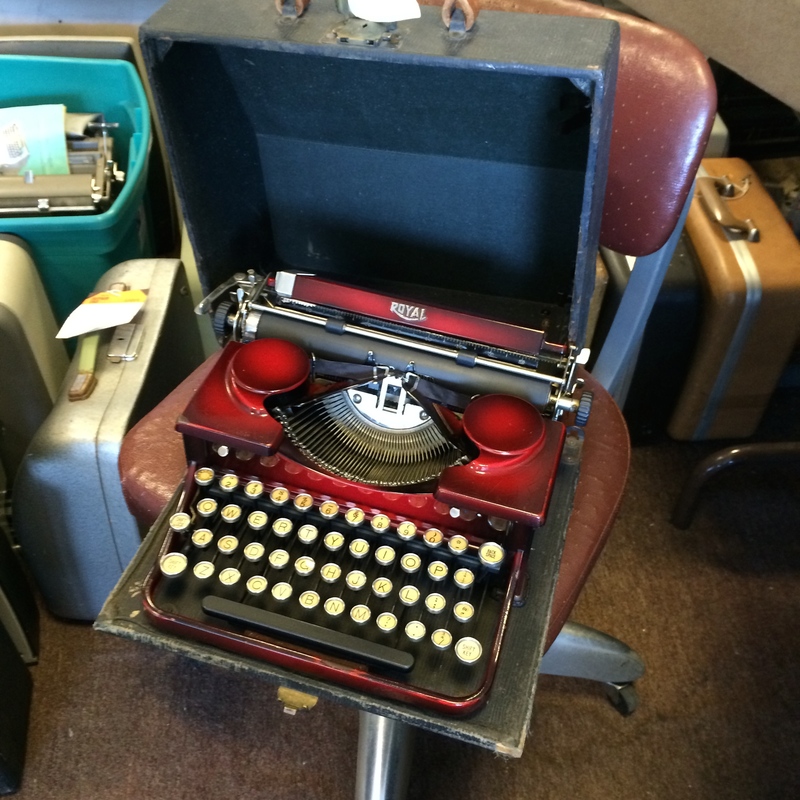 People do a double take when they travel by and see a standing room-only crowd outside a typewriter store. That’s my sweet little Olivetti on the far right of the photo, with the cover sitting on the box next to it like an upended beetle. Tom’s youngest customers more or less subscribe to this philosophy below, created by Xavier University Professor Richard Polt (self-consciously photographed on top of my MacBook Air keyboard, while in the back seat of a car.) 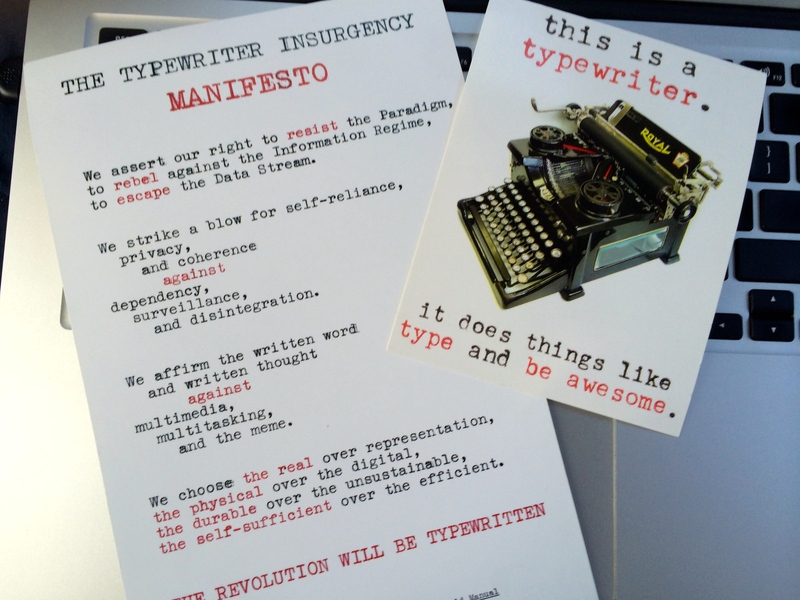 There is a whole active “back to typewriters” movement growing around us, organized here on Typosphere. In fact, if I were a member of this movement I would be creating this post directly on my refurbed Olivetti, and scanning it into WordPress, just like Tom does on his own blog, aptly named Life in a Typewriter Shop. One might even partake in forms of “extreme typing” which is parallel to the sport of extreme ironing–doing it in the most improbable of outdoor environments. I did find that as soon as I tested my typewriter, I was compelled to somehow go back to my teenage self and tap out my maiden name and childhood address. 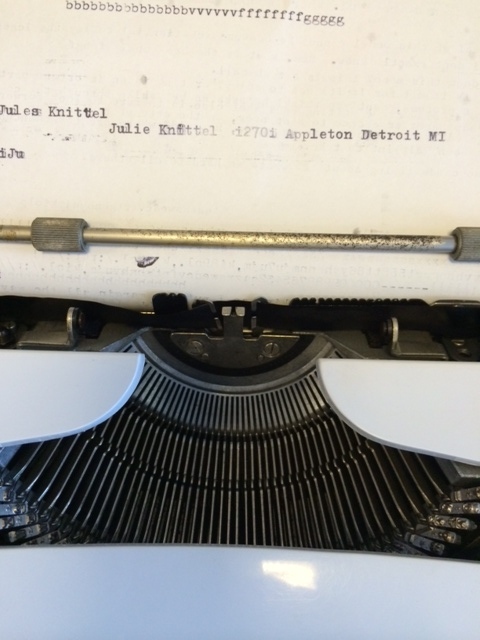 I have to reconcile this typewriting opportunity with new creative possibilities in 2014. Tom says his favorite customers are the teenagers coming in with their parents to buy their first typewriter. For them, it’s 100% manual purchases, not electric. They sometimes go for a jewel colored beauty like this. 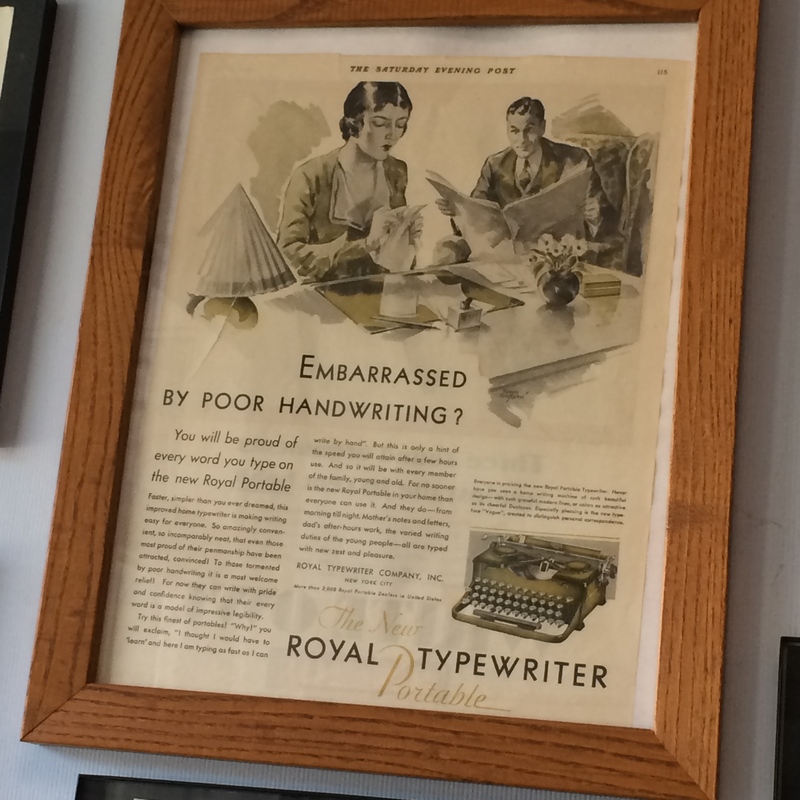 This Royal was originally sold in 1929 for $65. A nicely refurbished one goes for $350 today. They come in a wide array of luscious colors. 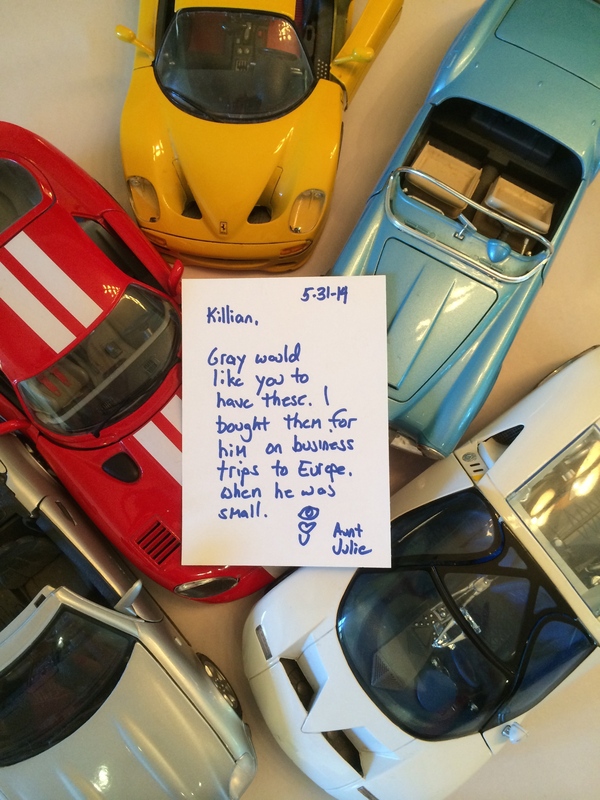 Some of his younger customers have gone on to request typewriter repair apprenticeships and they can often graduate to accumulating several typewriters. Tom knows exactly how much daily use these typewriters they are getting because he becomes their “dealer”…of ribbons. Tom with diminutive portable. It’s hard to see that the height is very low, perhaps about 3″ at most. 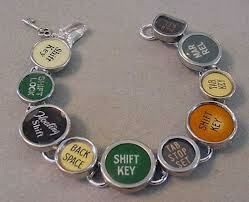 As we were speaking I imagined the inefficiency of returning to a manual typewriter. Surprisingly, Tom says that some professional writers find they can actually produce faster, better work on a typewriter because it slows them down and they are so much more careful with what they write. Some pros claim that they can save a couple of entire drafts of a book by avoiding a computer. 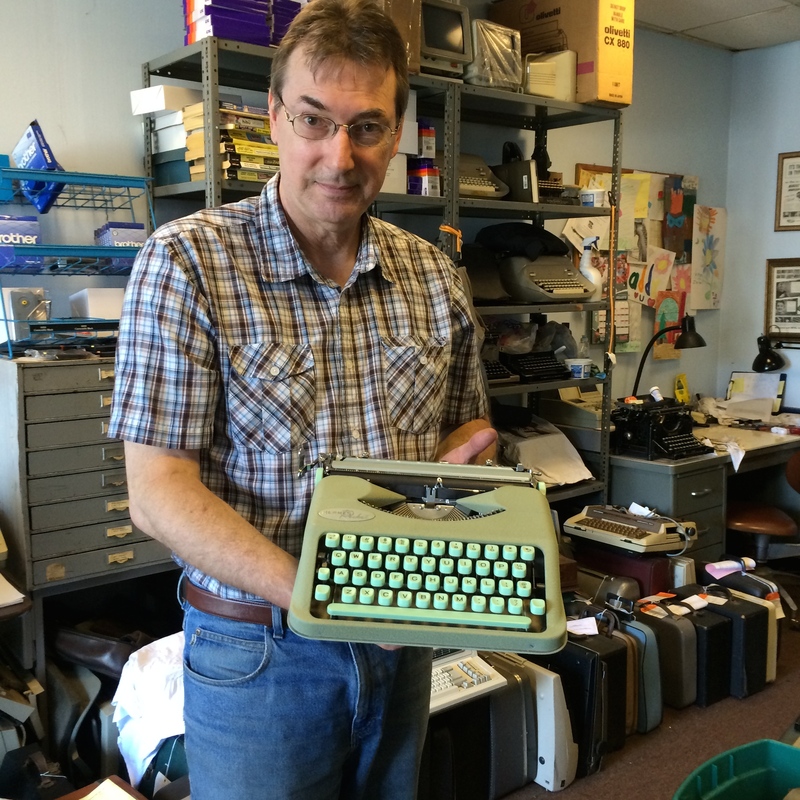 I learned a bundle from my field trips to Cambridge Typewriter. I had no idea of the very life force represented by the Typosphere movement. With no specific plans for my Olivetti, and still surprised that I am willing to store it in a small apartment, I do feel better about my decision. It’s not quite as irrational as I thought. I am practically part of a movement! Wherever this cool experience leads me, I have to acknowledge that this little typewriter surely was the unrecognized symbol of hard goals, realized. It must have, many years ago, imprinted on my visual memory and inspired my idea of this–my dream car–bought exactly a year ago. 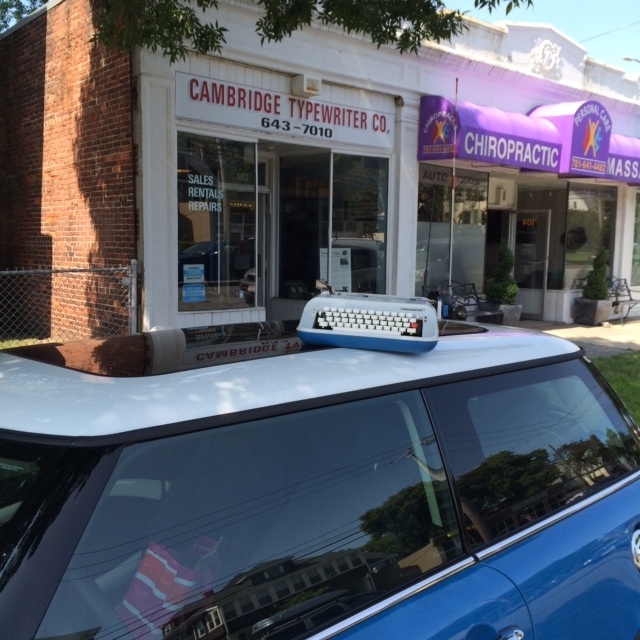 My little blue and white Mini Cooper can be seen here together with its predecessor the little Olivetti. 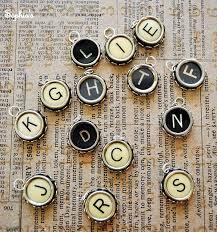 I drove that typewriter right in to college and graduate school and on to possibilities I could never have imagined as a scared 15-year-old just trying to survive in the threatening intellectual environment of a fancy boarding school. 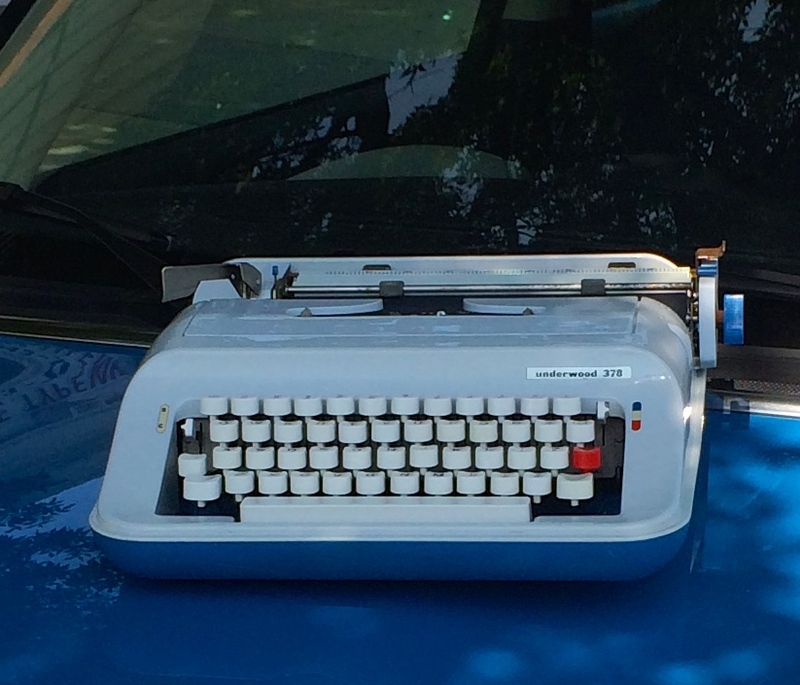 So I love this image of my car and typewriter, about to ride off together for adventures unknown. So cool! Thanks for sharing this video Deb.